Head to Houston’s Willow Waterhole and you’ll find picturesque marshes dotted with brown reeds and green plants, leaves raised to the sun. Try a little bird-watching, stroll along a trail or enjoy a picnic on the wide expanses of grass. But the 279-acre area is more than just a park. Officially the Willow Waterhole Stormwater Detention Basin, it’s actually a nature-based flood damage reduction facility that can hold up to 600 million gallons of stormwater. Channels slowly drain the water away, which would otherwise have moved downstream, flooding homes and businesses. The site is part of the Brays Bayou Flood Damage Reduction Project, a massive collaboration between the Harris County Flood Control District and the Army Corps of Engineers. Project Brays’ 75 elements primarily include widened and deepened channels, which will be able to hold more stormwater, alterations to the bridges crossing those channels and the construction of four stormwater detention basins. Willow is one of them. Stephen Benigno, an environmental quality section leader at the flood control district’s Environmental Services Department, said that most park-goers have no idea that spaces like Willow are multi-purpose. It’s an example of hybrid infrastructure, which combines both nature-based and traditional solutions to problems like flooding. Not only does Willow manage flood risk and provide a recreational space for Houston residents, it also helps conserve wildlife and restore the endangered coastal prairie ecosystem upon which Houston was built. Willow’s trees will grow into forest, so workers don’t have mow as much grass. 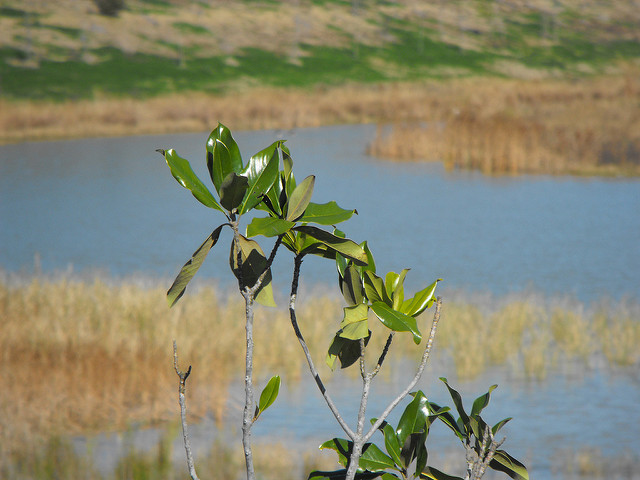 Plants within the waterhole help filter the stormwater, which otherwise would be carried, along with its contaminants, into the Brays Bayou and eventually to the Gulf of Mexico. “When [hybrid infrastructure] is applicable, the district uses it every chance they get,” said Benigno. And in August 2017, Project Brays prevented over 10,000 homes from being flooded by Hurricane Harvey, which dumped about a trillion gallons of water on Harris County alone. All of the county’s channels and its four detention basins, which can hold a combined 3.5 billion gallons of stormwater, were at full capacity sometime during the storm. Traditional gray infrastructure – like pumping stations and pipes – alone would have resulted in greater damage. Norma Jean Mattei, the American Society of Civil Engineers’ 2017 president, said that typical structures like pumping stations are designed to collect water and actively move it out of the area as quickly as possible, but have finite capabilities. In addition, she said, any hazards that take the systems offline during extreme weather events, even temporarily, will lead to flooding. Climate change could make weather events more intense, putting traditional projects under more stress. A 2017 National Oceanic and Air Administration study projected more severe rainfall and hurricanes for Texas as the climate warms. The fourth National Climate Change Assessment, released in 2018 by the U.S. Global Change Research Program, found that sea level rise along the Texas Gulf Coast is twice as high as the national average. A storm surge in Galveston Bay could put the entire country’s petroleum and natural gas refining ability at risk. During Harvey, surges in the area measured from one to four feet high. Nature-based elements could be part of a comprehensive approach toward these developing challenges. That’s something the Army Corps of Engineers’ dedicated Engineering with Nature initiative is taking to heart. In the organization’s Galveston Bay district, located right by Houston, it’s using a strategy called “multiple lines of defense” to take some of the strain off engineered features. Russo described an example in which using miles of wetlands in front of an earthen levee would reduce the daily battering the structure would take from the waves. The project would remain effective for longer. More engineers are recognizing the potential advantages that nature can bring to infrastructure.